Direct Action Inquiry – Giving evidence | It's Up 2 Us! It’s been a long couple of weeks building up to the Senate inquiry into the Direct Action Policy. Some incredible people spoke today and it was an inspiring and at times deeply distressing event to be a part of (although we did have some fun this morning as you can see from the image above). Thankyou for the opportunity to speak here today. I’d like to begin by acknowledging that we meet here on Whadjuk Nyoongar Boodjar. Whilst I speak here on behalf of 350.org I also speak on behalf of those who cannot speak for themselves. Particularly my nephew Corey born Last September and my Step Grand Daughter Charlotte who will be 2 in April. To use the concept of a Carbon Budget it has been worked out that to have a good chance of remaining below 2 degrees 80% of current fossil fuel reserves must remain in the ground. The work of Mike Raupach at ANU, demonstrates that at a 66% probability of not exceeding 2C, the carbon emissions budget remaining is around 250 billion tonnes of CO2. However this “carbon budget” also has a 17% chance of exceeding 2.5C and an 8% chance of exceeding 3C. If we want a 90% chance of not exceeding 2C, there is NO “carbon budget” left. However, if we work with a ‘good chance’ of limiting warming to 2 degrees it means 80% of the current fossil fuels need to be left in the ground. This will mean that $22 trillion worth of fossil fuel assets will have to be wiped off the balance sheet, leaving stranded assets and under-valued shares on a scale the world has never seen. To elaborate, right now fossil fuel companies and governments around the world have over 5 times the amount of fossil fuels we could ever afford to burn, and that’s without new exploration. The current business model of these companies, with the support of our government it to cook the planet. The Emissions Reduction Fund is designed to allow businesses to continue ordinary operations without penalty. This is not only dangerous for our health, homes, livelihoods and children, but also economically irresponsible. HSBC says coal assets in Australia could see their value halved in the next 24 months, while the Carbon Tracker Initiative says $674 billion annual investments in oil, coal and gas are at risk because they cannot be used if governments agree an emissions reduction deal at a UN summit scheduled for December 2015. We need to stop new fossil fuel projects and phase out direct and indirect fossil fuel subsidies. If Australia goes ahead with current fossil fuel expansion and export plans Australia alone will be responsible for 10% of the remaining carbon budget. This cannot be allowed to happen and is a long way from our ‘fair share’. PriceWaterHouse Coopers has stated we will blow through the current carbon budget by the year 2034. If we allow this to happen, as head of the IMF recently stated we will be “roasted, toasted fried and grilled’. The Direct Action Policy does nothing to address these issues, and as such it fails to protect Australians from the increasing impacts of climate change and the economic risks associated with stranded assets. Fossil fuel companies now need to be seen as rogue companies. With plans to spend 6trillion in new fossil fuel developments over the coming decade it’s the role of governments to place constraints and regulations on these companies to turn them into energy companies and protect our communities. Even for a 50/50 chance of not exceeding 2C, Anderson and Bows have demonstrated that for the high-polluting, developed economies such as Australia this means annual emissions reductions of 10% per year. Whilst the current suite of legislation is insufficient to tackle the risks we are facing it does at least place us on the front foot and provide us with the mechanisms to begin reducing emissions at the levels required. The Direct Action Policy is not based on science, and as such is like placing a wet rag on a burning inferno. In preparing for this presentation I used an interactive tool where I could see the predicted temperature rise expected during my lifetime. I’m 36, during my lifetime with business as usual which the Direct Action policy represents I could see 3.6 degrees of warming. My nephew Corey and Granddaughter Charlotte could see up to 6.3 degrees temperature rise during their lives. The Australian Government has a responsibility to do all that it can to protect Australians from this kind of future. We call on this senate committee to recommend rejecting the Direct Action Policy, retaining the current clean energy package and to drastically increase our emission reduction and renewable targets in line with 100% reductions by 2050. Acknowledgements: in writing this opening statement we borrowed from the work of many people and organisations. Particular acknowledgement to the work of David Spratt, 350.org, Charlie Wood, Tanyia Maxted-Jamieson, Carbon Tracker Initiative. For all who work on this this tirelessly, thank you. My work as a climate campaigner is crowd funded. To contribute use this link. 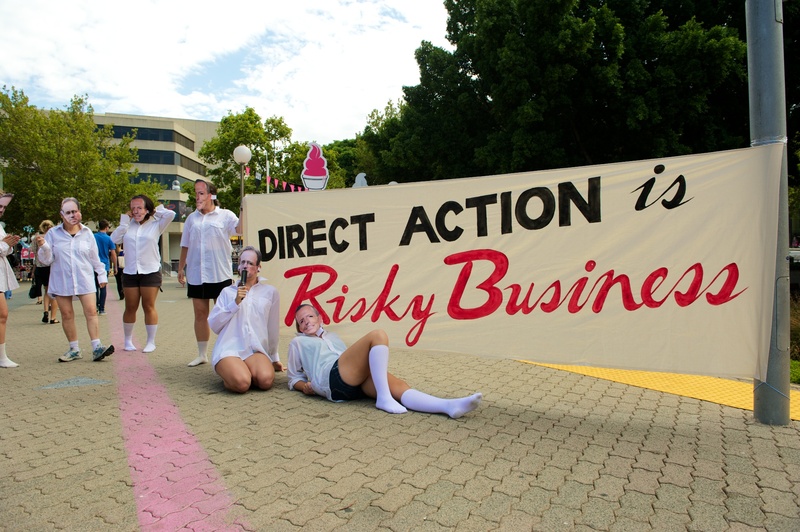 ← Direct Action – Is Tony Abbott right about this one?